11th of January 2016 was an important and ever memorable day in the history of SMYM. It was on that day the Major Arch Bishop George Cardinal Alencherry, in the presence of more than twenty Arch bishops and bishops,priests and youth blessed the office of the youth commission at mount St.Thomas.It was a great landmark in the history of SMYM. The election of representatives from SMYM to KCYM to the next Secretariate was conducted on 15th of January 2016.Mr.Sijo Elanthoor(President),Justin and Tessy (Secretaries)were elected unanimously . On 20th of February 2016 Fr. Sebastian Kaippanplackal, Secretary to the Commission for Youth, took charge at the Youth Commission office at Mount St.Thomas with stay at St.Josephs Church, Kalamassery. The Committee had several sittings with bishop discussing over the name, bye-law and the nature of the new youth movement. 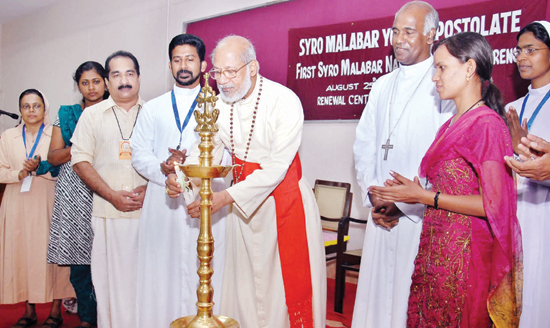 The Syro Malabar Youth Apostolate was proposed to be the name. The name SMYA was proposed because it was meant to include all the youth organizations at the time in our church but limitting to the age of youth at 30. On the 9th of September 2011 the organizing committee was held at Ernakulam Archbishops house which was presided over by Mar Sebastian Edayanthrath.It was mainly meant to design the future programme and the bylaw for SMYA .It was also decided to formulate an adhoc committee consisting of representatives both from within and without Kerala. Following the guidelines of the former meeting held on 9th of September2011 Youth,directors and animators representatives were selected, in consultation with Mar Sebastian Edayanthrath, to form an Adhoc Committee from various dioceses. Two meetings of the adhoc committee,on 14th of January 2012 and 26th of May 2012, were held at Renewal center, Ernakulam, discussing on the basic form of the bye law. Many suggestions were given by the commiittee. Youth gatherings and discussions for the formation of the bye law was considered to be a need and Fr.Sebastian Kaippanplackal was asked to take the necessary steps to convene the meetings with proper information. The Final Discussion of Bylaw in the Province level. The final version of the bylaw, Anthem and Emblem were presented to the Directors,Animators and Youth of different provinces of the proper territory and were discussed. On 16th of June the Malabar Regional meeting and discussions were conducted at Sandesh Bhavan, Thalassery at 4pm and ended up with supper at 9pm. Representatives from Thalassery, Bhadravathi, Mananthavady and Thamarassery participated in the meeting with innovative ideas and remarks.The meeting was guide by Mar Joseph Pandarasseril.. On 25 th of June a meeting of the bylaw discussion was held at BLM Irinjalakkuda. Thrissur and and Irinjalakuda dioceses participated in the meeting. Kanjirappilly Amal Jyothi College hosted the meeting for the Changanacherry province on 16th of July 2016 at 10 am onwards.Changanacherry, Kottayam, Palai and Kanjirappilly participated in the meeting. In the evening a meeting was held at Karimpan St .George Church for Idukki Diocese.It was decided to include the apt sugestions to the bylaw. The importance of the youth is increasing day by day. By 2020 one among the ten youth of the world will be an Indian.This is true in the case of Syro Malabar Youth too.So the concern and encouragement to be given to our youth is of immense importance.Yoth commission and SMYM are two remarkable land marks in the history of the Syro Malabar Youth Ministry.But it is in the begining step where we all together have to travel with the youth a lot before we sleep.The words of encouragement and the cooperation of bishops in the implimentaion of the vision and mission of the SMYM is of great importance.The initiatives taken by major Archbishop Mar George Cardinal Alenchery to bring all the youth of the Church under a single umbrella surpasses words.We are also proud of the Commission members and their sweat and tears shed for the Youth Ministry all these days.We also express our heartfelt gratitude to all Bishops for what they have been to us.